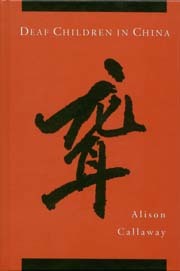 To learn how Chinese parents raise their deaf children, Alison Callaway in 1994 conducted extensive research in the city of Nanjing. There, she interviewed the parents of 26 deaf children while also carefully analyzing a large collection of letters written by other parents to the supervisor of a nursery school that was the center of her research. She also made fact-finding visits to several other schools and programs for deaf preschoolers, and had discussions with teachers, administrators, and staff members. The results of her study form the remarkable body of information presented in Deaf Children in China. Callaway crafted a comprehensive interview with 133 questions, 106 of which were strictly factual while 27 asked parents for their views, attitudes, reactions, and perceptions concerning various issues. Through detailed background analysis, she was able to enhance her interpretations through a balanced assessment of the cultural influences in China, such as the role of the family and the government’s “one-child” policy. Although she speaks Chinese and is raising her Chinese son, she consciously monitored with even greater care any potential biases from her own Western antecedents that might affect her research. Deaf Children in China provides a striking profile of the views and attitudes of well-educated Chinese parents with preschool-age deaf children. Callaway’s inclusion of a survey of 122 English mothers of deaf children reveals the differences between Western and Chinese parents, who rely upon grandparents to help them and who frequently search for medical cures. Yet, she also discovered that many issues cross cultures and contexts, especially the problems of achieving early diagnosis and intervention for all deaf children, and optimizing early development of language in deaf children of hearing parents. Her pioneering work will fascinate and enlighten readers invested in the development of deaf children for years to come. Alison Callaway, a medical doctor in Oxford, completed her doctorate at the Centre for Deaf Studies at the University of Bristol in England.